This was absolutely wonderful, and very easy to pull together once everything is chopped. I made it ahead of time on the weekend, and then just added the last bits before serving on a weeknight. The tahini added richness, but I didn't think it was necessary and would probably skip it in the future, since it dulled the flavors a bit. The tahini-crusted aubergine was delicious, and went very well with the salad. I used barberries and dried cherries in place of the cranberries. 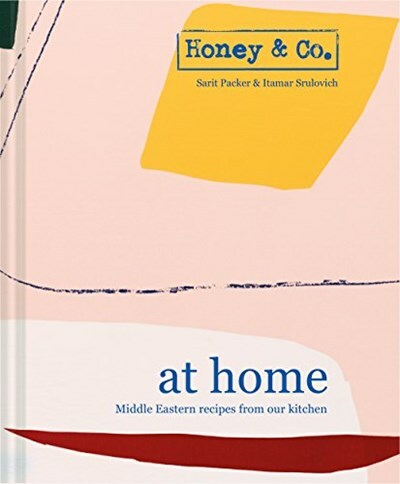 Brought to you by the award-winning chefs behind the Honey & Co. empire, Sarit Packer and Itamar Srulovich present simple and delicious Middle Eastern dishes that are easy to make and a pleasure to serve. From breads to bakes, salads to sweets, there is something for everyone in this celebration of Middle Eastern cooking. Wholesome, fresh and seasonal ingredients are organised into chapters For Us Two, For Friends, For the Weekend, For a Crowd and The Kitchen. Enjoy authentic recipes like Jerusalem sesame bread filled with harissa and lemon chicken, tuck into a crisp salad with saffron-poached pears with walnut tahini, or delight in a fish pastilla or a rabbit stifado, among many more. The mouth-watering recipes featured in this book are quick and simple to make. Whip them up for lunch or a weekend meal without forward planning, special ingredients or fancy equipment - these will quickly become staple recipes that you, friends and family will revisit again and again. Packed full of stylish and stunning photography, At Home takes Sarit and Itamar out of the restaurant kitchen and into their home, and is filled with the stories in food that mean the most to them. The recipes and surrounding text is written from the heart with affection for the food they love.